An Accurate Lunar Eclipse, At Last! 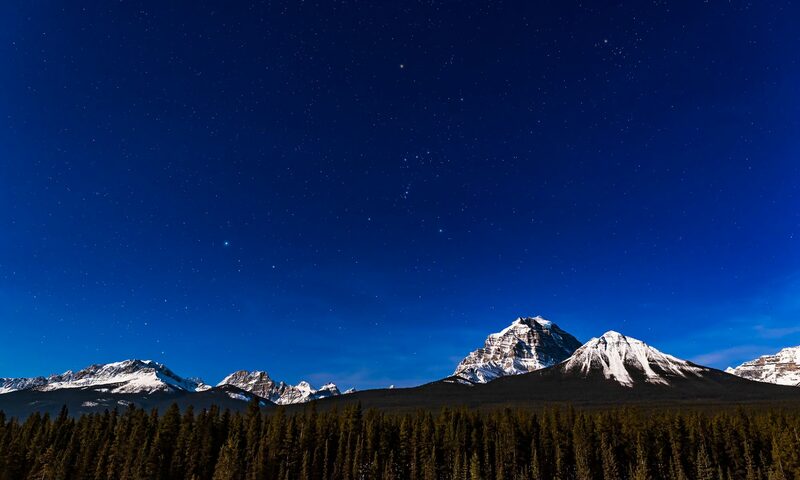 For years we astrophotographers have been thwarted by our recording media’s inability to capture a wide range of brightness in one exposure. A classic example is a lunar eclipse. The range in brightness between the non-eclipsed Full Moon and the part of the lunar disk in the Earth’s shadow is so great no one exposure can grab it all. You are left with either an over-exposed crescent or a dark under-exposed eclipsed Moon — nothing that looks anything like the eye can see. At last, modern image processing comes to the rescue! This is a stack of 9 exposures, from 1/125th to 2 seconds, all at f/6 with a 130mm apo refractor and Canon 7D camera. The images were stacked and merged into one “high dynamic range” image using Photoshop CS5, whose new HDR mode is wonderful! A little tweaking of settings in the Tone Mapping dialog box, and voilá! 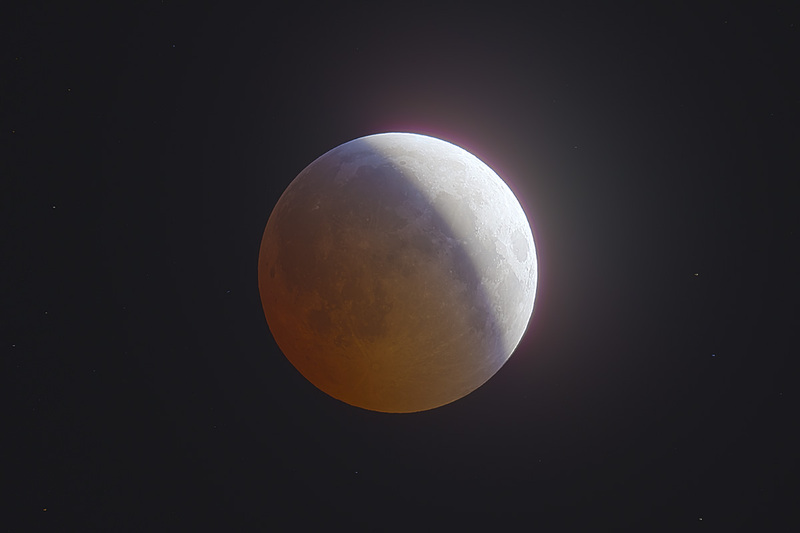 An image of the partially eclipsed Moon that really looks like what the eye saw. I’m impressed. 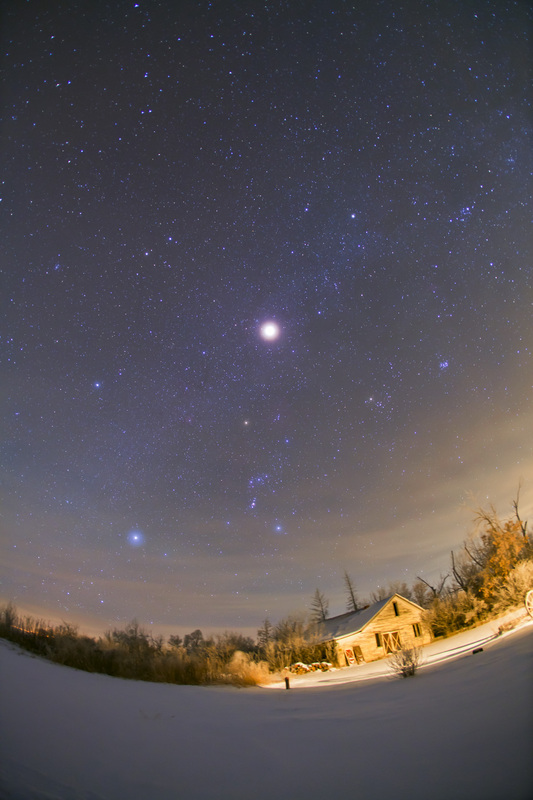 The December 20, 2010 total lunar eclipse promised to be a photogenic one. With the Moon smack dab in the middle of the winter Milky Way, it was going to be a great sight, as the Milky Way appeared during totality. The event did not disappoint. Though some haze intervened, I wasn’t complaining, as the weather has been so poor of late, we were lucky to get a clear night at all, despite having to endure -20° C temperatures to take in the event. This shot captures the scene from my backyard during totality, with the over-exposed eclipsed Moon sitting in the Milky Way above Orion. The naked and binocular view was truly stunning. I got back from Australia in time to see this event from home, squeezed in between Oz and a Xmas trip to the rainy west Coast. The plan worked! I managed to catch the eclipse, against the odds, which defeated many across Canada. Alberta was one of the few clear places for this event. I had considered a hasty trip to Arizona for it, but decided against it — a good thing, as I think they had cloud. The winter of 2010/11 is proving to be an awful one for many. I have not managed to get back to Australia since 2008, and had long planned for a trip in the November-December period, to get the Magellanic Clouds and “winter” Milky Way area of Orion, Canis Major, Puppis and friends, regions of the sky not well-placed in the usual months of my Oz trips in March and April. I planned a trip for late 2010, a month under southern skies, with 2 weeks at my favourite dark site, Coonabarabran, NSW, which bills itself as the Astronomy Capital of Australia — the Siding Spring Observatory, Oz’s major optical observatory complex is down the Timor Road. I rented a cottage for the period, which worked out great. The site could not have been better. The weather could not have been worse! I go to Oz prepared to lose about 50% of nights to cloud, but this time, out of 15 nights in Coona, only 2 were clear and usable. Torrential rains deluged the area of the Central West of NSW, causing severe flooding all around me. On one trip back from Parkes, I had to detour 200 or 300 km around through the Hunter Valley just to avoid washed out roads and get back home. Indeed, at one point I had to plough through one town whose main streets were being inundated with a torrent of water. When it did clear, it was humid! But I got two nights of great shooting in. The skies were transparent. The one thing about Oz — when skies are clear they are dark and clean. The best I’ve ever seen. 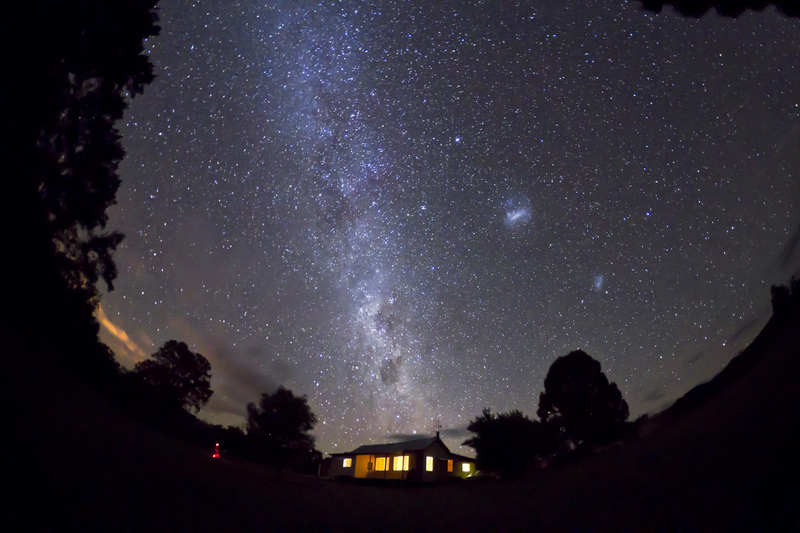 This is a single, tripod-mounted shot of the southern Milky Way and Magellanic Clouds, over the cottage that was my retreat and home for two weeks. Would I go back? You bet! It is still astronomy paradise for me. Even if skies are cloudy it is a chance to enjoy a writing retreat and a time to quietly work on projects long put off. Every astrophotographer has an object or field that seems to defy capture. 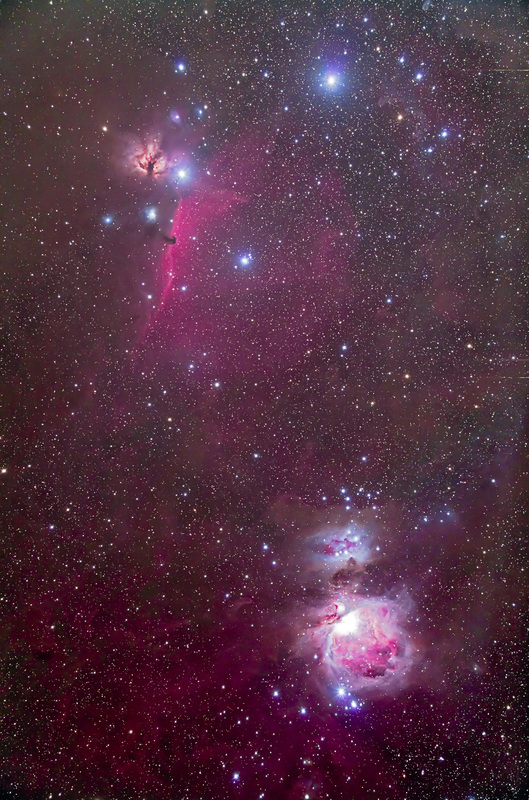 For me, shooting the Sword of Orion has always been beset by haze, tints from light pollution and low altitude — something has always gone wrong. At last I managed to get a good shot of the region. It was a priority for me on my Australia trip of December 2010. Even though I ended up with only 2 clear nights to do any serious shooting, out of 15 I was there, I really wanted to grab this area, while Orion was high in the north, and higher in altitude than I can get it from home, so less hindered by sky gradient tints. This is a shot with the wonderful Borg 77mm f/4 astrograph (which is tack sharp across the field) and the modified full-frame Canon 5D MkII camera — both items purchased from Hutech Scientific, a great source of astrophoto gear. This is a stack of five 7-minute exposures at ISO 800, processed in Photoshop CS5.